If this sounds like it is straight out of a military handbook, there’s good reason. Head coach Christopher Mendez picked up the sport as an undergrad at the United States Military Academy at West Point, where he was a two-time All-American and two-time runner-up at the National Collegiate Boxing Association national tournament. He structures the team hierarchically—there are two team captains, four squad leaders, and each team member is assigned a “Ranger Buddy,” who is expected to form an especially close bond with that teammate and be able to account for his or her whereabouts. The smaller squads within the team serve to intensify the spirit of competition, which is expressed by Mendez’s “optics”: posted at each practice is a listing of each squad’s attendance, GPA, and the individual results of the most recent Army Physical Fitness Test. By the end of October, almost two-thirds of the new faces have packed it in. Unfortunately for the 44 hearty souls who have survived, there are only 19 roster slots available. For Mendez (MBA, UW Bothell, ’08), the ideal candidate needs to be supremely well rounded: a scholar, an athlete and tenacious as hell. He is quick to emphasize that the “scholar” requirement come first. In fact, he refers to the team not as a sports club, but as a “leadership development program.” While the team is only in its fifth year, its legacy is already substantial. Six alums have been accepted into medical school (including two at UW), another has completed Navy SEAL training, and several others are off to strong starts in law, finance and other careers. The Huskies are no slouches in the ring, either. The team earned the national championship in the women’s division last spring, and Taylor Williams was named the tournament’s most outstanding female boxer. Williams, a senior majoring in English, now shares duty as team captain with senior Albert Ta. Neither is especially vociferous, but they lead with a determined, businesslike approach. 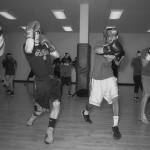 Their role, along with the other experienced boxers, becomes apparent as team practices move into winter. 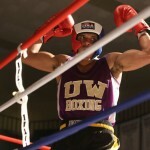 There are amateur or college boxing shows most weekends during the winter and early spring to which the UW team will send several boxers; Coach Mendez and his assistants Ricardo Acuna and Charles McClain need to devote the bulk of their time getting these boxers prepared. As such, team members must demonstrate the leadership principles they have learned from Mendez or gleaned from the readings they are frequently assigned. 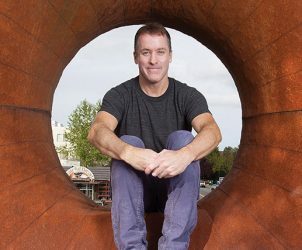 During the course of any given practice, dozens of teaching moments occur among the athletes, from fundamental techniques to tactical minutiae that abound in the deceptively complex sport. The smooth choreography on display during practices is a byproduct of a larger harmony at work: Ask any UW boxer about their experience, and they invariably utter the word “family.” Fifth-year senior Stanislau Kabacheuski is no longer eligible to compete. He has a job offer sewn up with a Big Four accounting firm and doesn’t expect to box after leaving school, but he values the relationships with his teammates too much to walk away. “Boxing has always been more about the family environment,” he notes, “and trying to build something from scratch.” In his case, the sense of familial duty is literal: His younger brother Hleb earned a spot on the team this year. In late January, the team plays host to the Main Event at the Washington Athletic Club (WAC) for two nights. 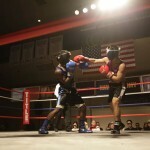 The event is atypical of most college boxing exhibitions. The spotlights, ring announcer, and audience dressed primarily in formal wear are trappings usually reserved for the professional ranks. The WAC is a special treat for the UW boxers, and a prime opportunity to show supporters and donors (who are called upon to foot the team’s substantial travel budget) that the team is capable of going head-to-head with the service academies and the rest of the college boxing elite. 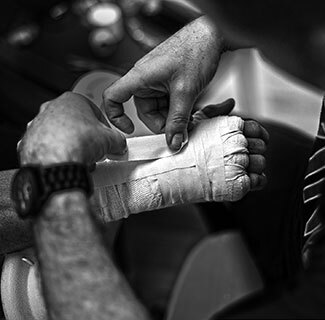 Despite the pomp and circumstance on display, boxing is still the real business at hand—and the bouts offer a stark reminder that the sport is more demanding physically and mentally than anything most people will volunteer for. A pair of victories that bookend the second night of the event, however, illustrate that there is something special about the squad in purple and gold. Freshman Joscelyn Robles is slated to open the action for the Huskies. 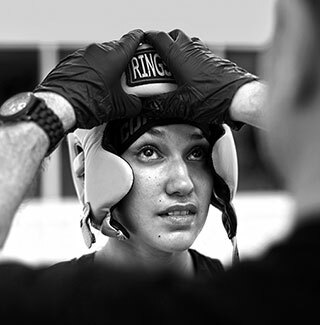 Unlike most of her teammates, she has previous experience in the sport, but hasn’t stepped into a ring in five years. Fifteen minutes before her UW debut, Robles sits with coach Mendez for final instructions and a pep talk that soon has her in tears (and him on the verge). Whether due to nerves or by design, the bout starts at a furious pace, which doesn’t slow much over the first two rounds. Meanwhile, her teammates anxiously cluster on the track that overlooks the ring, cameras at the ready to capture the moment. Robles methodically flicks her jab, but more importantly, doesn’t offer much real estate for her opponent to land anything more than glancing blows. By the third and final round, both boxers are gassed but Robles avoids making any crucial mistakes and soon has her arms raised in victory before her beaming coaches. In a sport that can be the loneliest in the world for its practitioners, the UW convincingly demonstrates that it can be a team sport. From the way the team conducts itself behind the closed doors of its practices to the way it convenes for a thunderous cheer before one of its brethren steps into the ring, the team motto is genuine: Pride. Poise. Team. 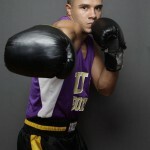 AUTHOR’S NOTE: Shortly before this issue went to press, four UW boxers—Albert Ta, Taylor Williams, Richard Vansiclen and Jacqueline Ines—claimed titles at the prestigious Golden Gloves Championships, “a huge step in our young program,” says coach Mendez. 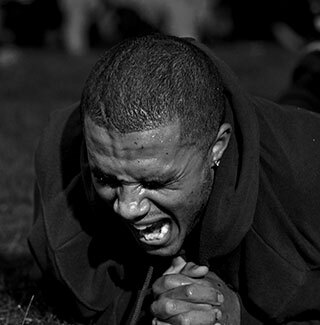 Flutter kicks yield grimaces during a Boot Camp session in October. Team members and aspirants dig in for tug-of-war during a Boot Camp session in October. Team members shadow box during practice in the IMA in November. Team Captain Albert Ta (right) throws a punch during a bout at the WAC’s Main Event in January. Richard Vansiclen anticipates victory following his Main Event bout against a boxer from the U.S. Naval Academy. Head coach Christopher Mendez and assistant Ricardo Anuna provide support at the Washington Athletic Club in January. 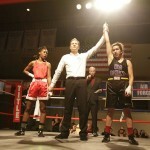 Robles earns a unanimous decision in her UW Boxing debut. Michael and Mark Klebeck, the brains behind Top Pot, have something going on.